The last months I’ve been experimenting with new lifestyle changes and one of those changes has involved cutting back on coffee as well as a few other delicious beverages (red wine, beer). 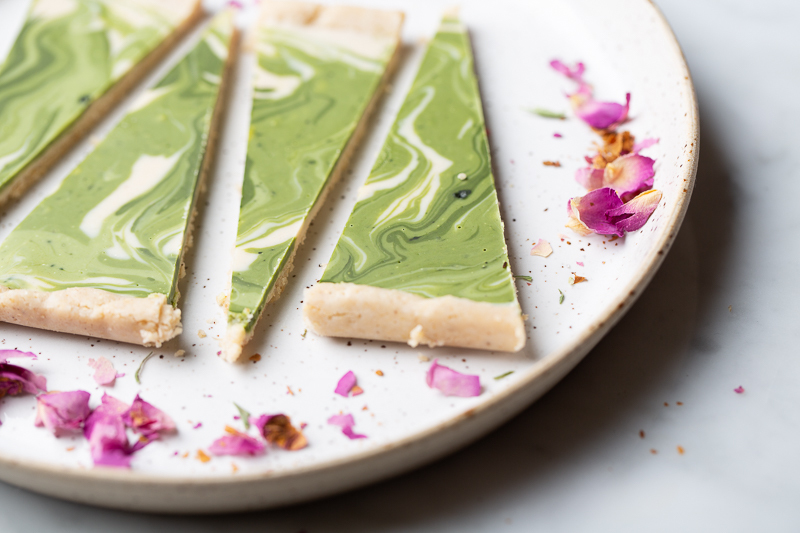 The inspiration for these slices came from my desire to cup back on caffeine and out of that came these magical slices of matcha and white chocolate. I swear that you will fall in love with them! It doesn’t come from nowhere, though. I’ve had some major changes in my menstrual cycle and have done a lot of research. 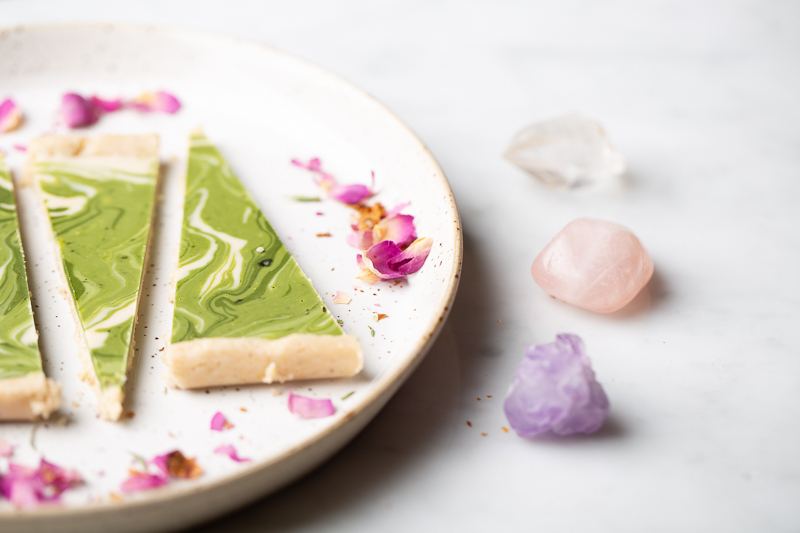 The work of Alissa Vitti and Sara Gottfried have been very helpful and both see a very strong link between food and healing and in particular certain foods seem to worsen conditions related to hormonal imbalance. From both of their protocols I learned that coffee and caffeine in general disrupts the hormonal balance and in particular cortisol resistance which can lead to overproduction of progesterone which results in loss of periods, weight gain and skin issues, all of which I am suffering from. The gut/health connection is also a major theme of both ladies. Since then Ive been exploring other options albeit not always caffeine free. Easing into a completely caffeine-free lifestyle is not an easy feat for me since I was used to drinking two cups a day but I decided to try a gentler approach into letting it go for good. That means black tea (Earl Grey never tasted so delicious) and then replacing that with Matcha and other green teas and eventually switching entirely to herbal teas. I know it may seem drastic for some of you but I have been doing pretty well and I don’t have mid-afternoon headaches that I used to have after a bad night of sleep. Whenever I was feeling tired I would simply take a nap. What a revelation! The recipe is more or less an adaption of my chocolate tahini bars. I’ve been trying different flavour combinations and I wanted something that is not so chocolatey but still delicious. 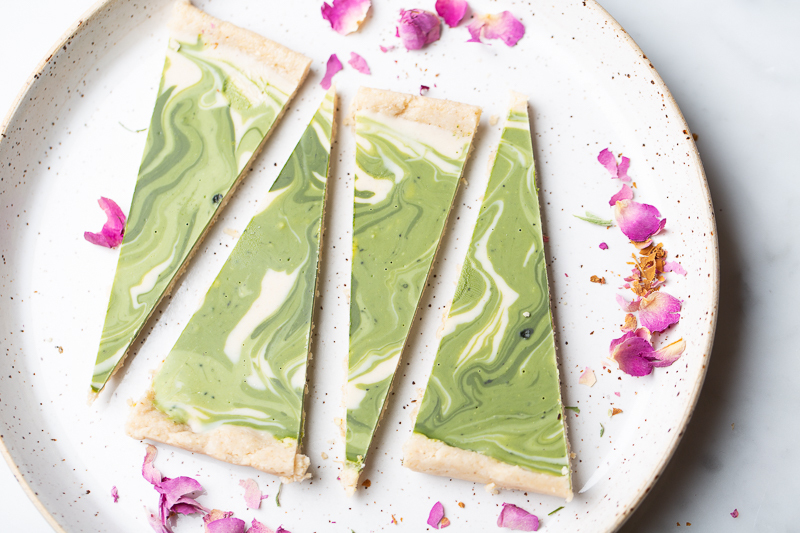 Matcha can be used in the same way you would cocoa powder. It is also bitter but adds a subtle flavour and a beautiful layered green pattern. 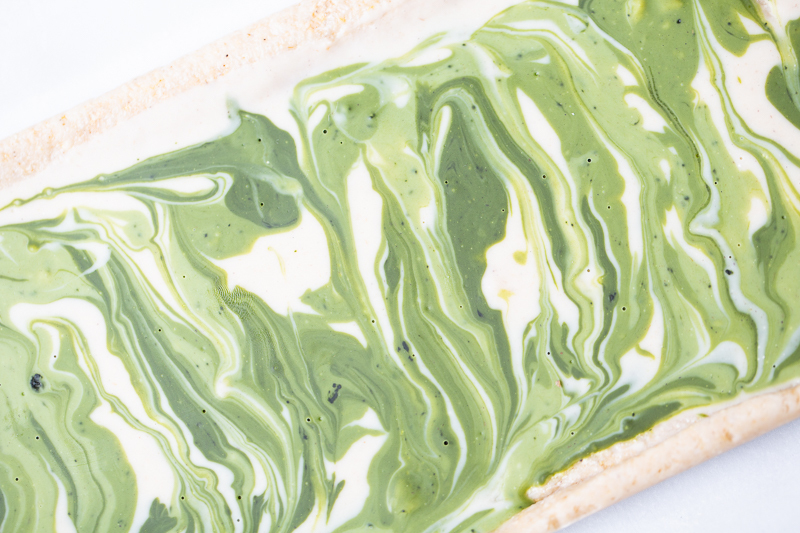 The white chocolate mellows the flavour of the matcha which is great for those new to it. I used a rectangular tart tin but you can also use a small brownie pan or a loaf tin lined with parchment paper. I also used a touch of orange essential oil but that’s entirely optional. I thought it added a really nice citrusy touch. In addition to being beautiful, they are easy to make and can be packed as a delicious treat for your lunch box and to make your work colleagues or classmates really envious. Finally, don’t forget to report back if you make these. It would make my day! Please share these on social media with the hashtag #vegan__art. Thanks and have a great day! Line a small baking tin, either a loaf pan or rectangular tart tin with parchment paper. For the base, line a small baking tin with parchment paper. Place the coconut, oats and cashews in a food processor and pulse the ingredients for a few seconds until it forms into a fine flour. Add the remaining ingredients and pulse a few more seconds until it starts to lump together. If it is not sticking add a teaspoon of coconut oil at a time. Press the base into the baking tin evenly so that it covers the base evenly with a slight rim on the edge. Melt the white chocolate and cocoa butter together in a bain marie. Add the drop of orange essential oil , if using. Divide the matcha powder into 2 little bowls adding more matcha to one of them. Pour half of the white chocolate mixture into the tin and spread it evenly with a spatula. Divide the remaining white chocolate into the two bowls and stir in the matcha until smooth. One of them should be darker than the other. 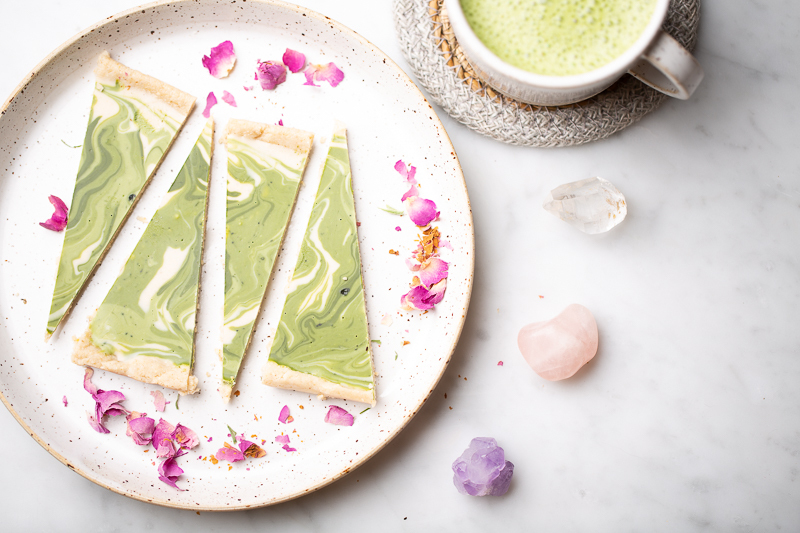 Drizzle the two matcha shades into the tin randomly, creating a pattern by dragging a chopstick or other stick through the white and green to create a pattern. Chill in the fridge until firm, about 20 minutes, then remove from the fridge and cut into triangular wedges or slices and enjoy!